It’s almost impossible to pass through Barcelona without setting foot in the Barrio Gótico, a warren of narrow, winding streets and medieval buildings that is the historic center of the old city. It’s also the epicenter of Barcelona’s tourist trade, which means that amongst all the Zara window displays, souvenir shops and tapas joints of questionable quality, it can be difficult to catch a glimpse of what the neighborhood once was. One lucky day, however, as we made our way through this touristic mishmash, we stumbled upon La Pineda, a true gem of old barrio authenticity. The sign over the entrance says La Pineda was established in 1930, but it has actually been around even longer. In the 19th century it served as a place to slaughter pigs and prepare meat. 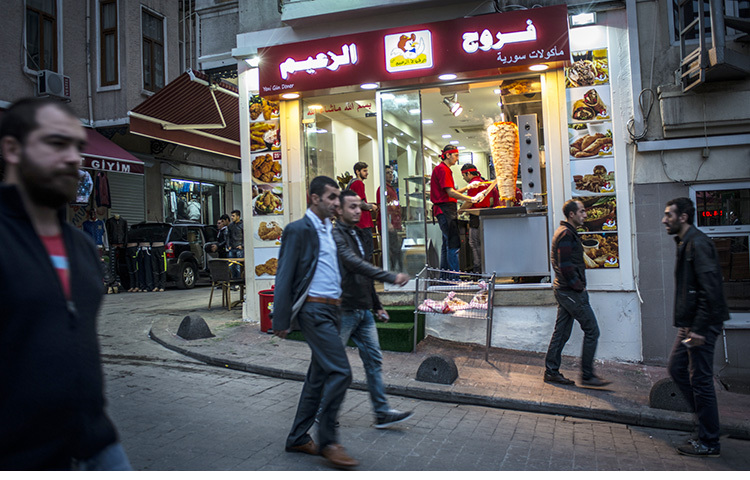 Sometime around the turn of the century, it became what is known as a colmado, a small store selling food supplies such as salt, sugar, cooking oil and conservas (tinned or jarred foods). Prior to the 1950s and the opening in Spain of the first self-service supermarkets, it was at these stores that people did their basic food shopping; everything was kept on shelves behind the counters and customers would wait their turn and then ask for each product individually. 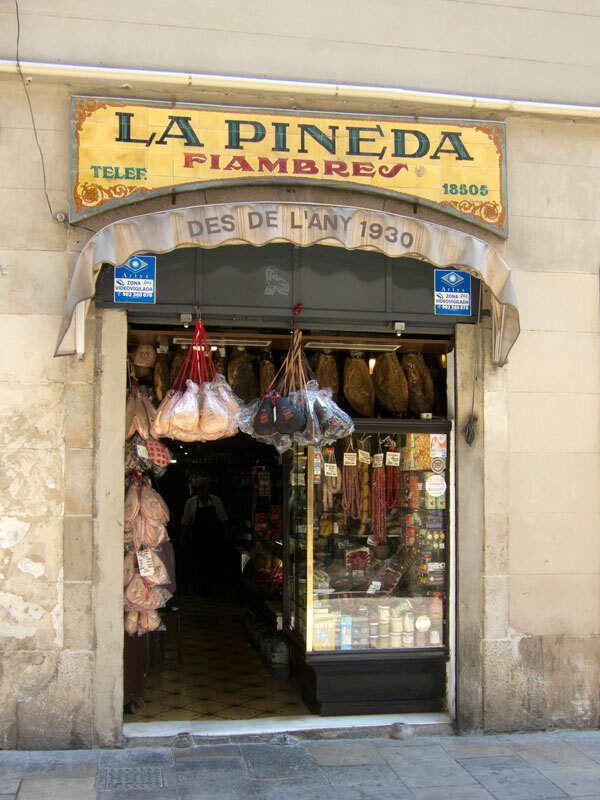 As the years passed and large supermarkets took over, La Pineda began to focus more on selling embutidos (sausages) and cheeses along with the conservas. 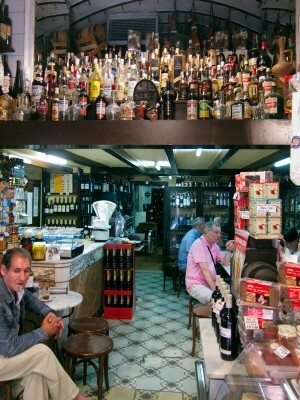 The proprietors also installed a marble-topped bar in the back and started serving snacks and drinks at the charcutería. In 1976, Antonio Segovia, then 14, arrived in Barcelona and began working at La Pineda. After a few years, he was joined by his younger brother José and now, nearly 40 years later, they run the place. Many things have changed since the brothers first showed up: Carrer del Pi is now full of fashionable boutiques selling designer sneakers and the brothers’ hair has turned snow-white. 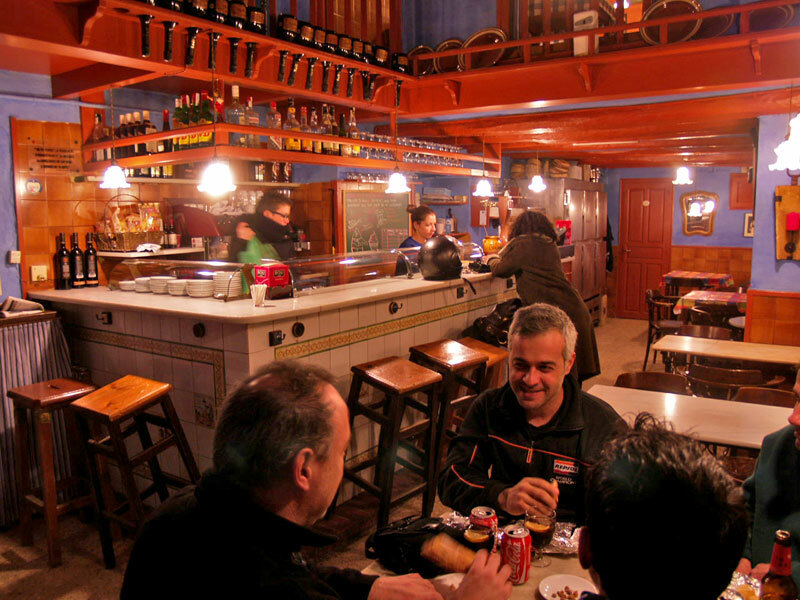 Nevertheless, La Pineda itself remains the same as it has for decades. 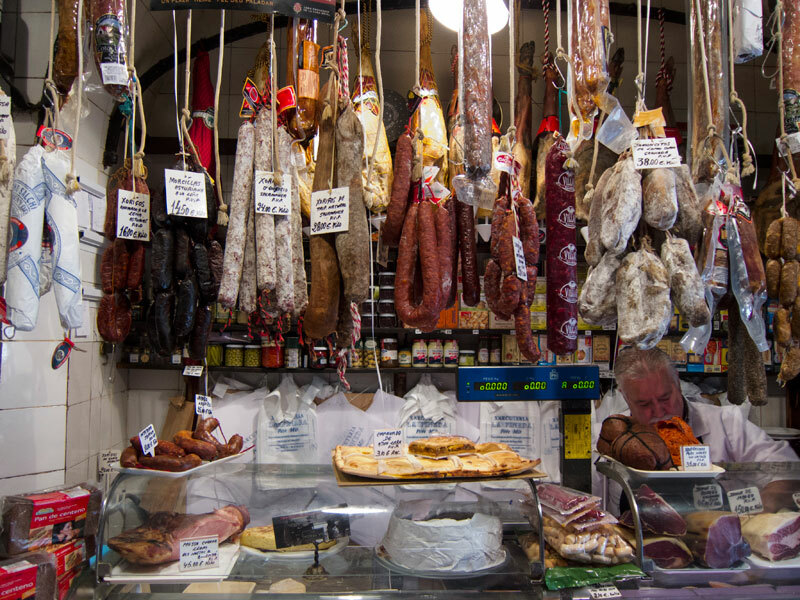 Cured hams hang from the iron hooks in the ceiling; the glass display cases are jam-packed with tempting cheeses and sausages; and white asparagus, mussels, sardines, bonito del norte (albacore tuna), razor clams and even hot dogs have been packed into jars and tins and stacked floor-to-ceiling. 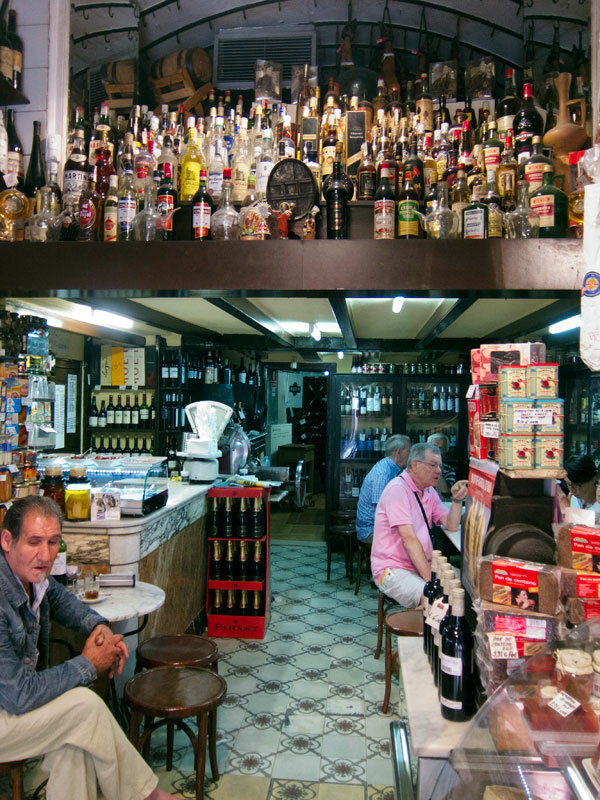 Although the space is tiny, they have managed to fit in a half dozen small tables for customers to settle in and enjoy a glass of house-made vermut with a plate of sausages and cheese or a bocadillo (sandwich). 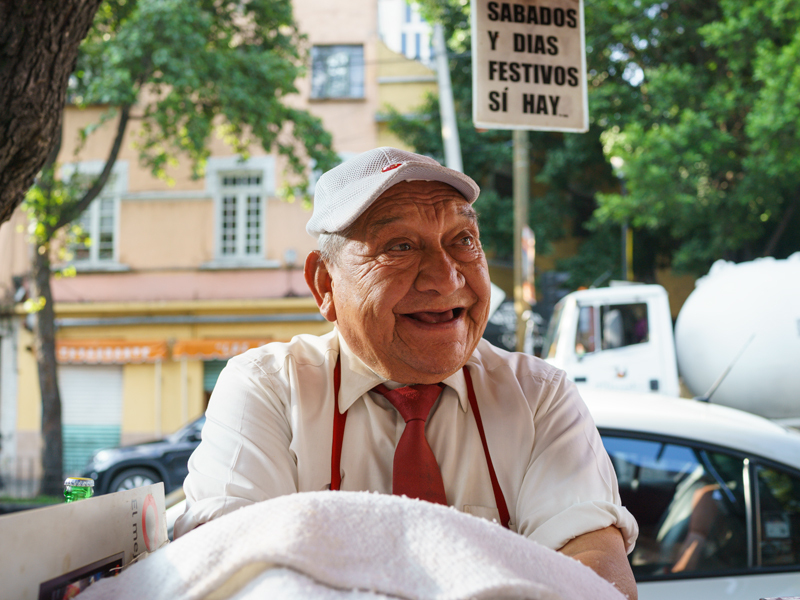 La Pineda has become a meeting place of sorts for elderly neighborhood regulars. The man who provides the bread teaches chess lessons at one of the tables in back; another fellow regularly plays the guitar; and yet another comes several times a week to perform magic tricks for bemused customers while singing “Fly Me to the Moon” in heavily accented English. The atmosphere can’t be beat, but that’s not the only thing that keeps the old-timers coming back. Over the years, the brothers have managed to put together a top-notch list of suppliers, and their meats, cheeses and tinned seafoods are all of excellent quality. 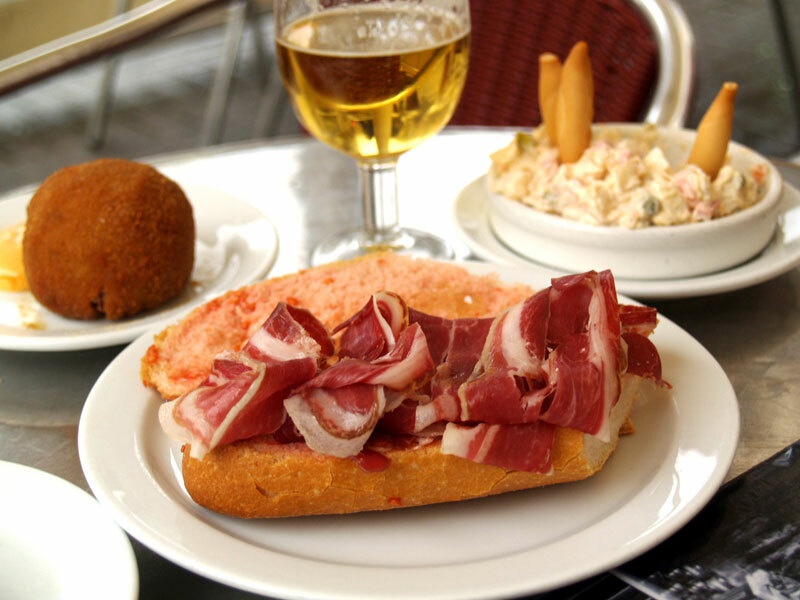 There is morcón – a cured, paprika-flavored sausage similar to chorizo – from Jabugo; white and red longaniza from Murcia, made with lean pork and chopped bacon seasoned with black pepper; and chistorras, fast-cured sausages with a high fat content, from Pamplona. 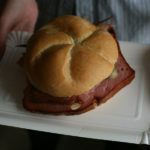 But what we really can’t resist are the butifarras (botifarras in Catalan). This savory sausage – one of Catalonia’s most typical foods – is made by stuffing a natural casing with minced pork, salt, pepper and other spices. A seemingly infinite number of other ingredients can also be added, including honey, pine nuts, raisins and calçots (spring onions). On any given day at La Pineda there are at least four different varieties of butifarra on offer, and on a recent visit we asked Antonio to give us a sampler plate. The butifarra made with egg was a creamy yellow and nearly melted like butter in our mouths. The rice butifarra was far paler in color, with a slightly milder flavor, but was just as succulent. Also on the plate were thin slices of butifarra negra (made with blood) and – our favorite of all – the butifarra with ceps (porcini mushrooms). 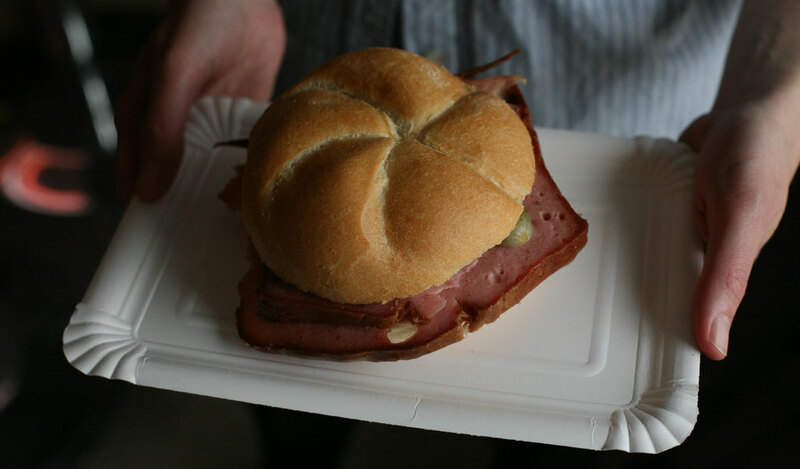 This last sausage had the same rich flavor, accented by a spicy mushroomy depth that made us close our eyes and sigh with contentment. We washed everything down with a glass of the house vermouth. We’re not the only butifarra fanatics at La Pineda. In 2010, a group of younger customers – who are also performance artists – went so far as to form the Buticlub, a “butifarra appreciation society,” with La Pineda serving as club headquarters. This motley group of exactly 50 members includes longtime regular patrons, journalists, artists and designers, each with their own badge and member number. Naturally, members #1 and #2 are José and Antonio. “We love butifarra and we also love this place. It’s so authentic and these guys have so many stories to tell. We started Buticlub because we wanted to find a way to share those stories with as many people as possible,” co-founder Dave Glass told us. We aren’t yet members of the Buticlub (one of the original 50 members has to either resign or die before that can happen), but that doesn’t mean we can’t appreciate butifarra with the best of them. 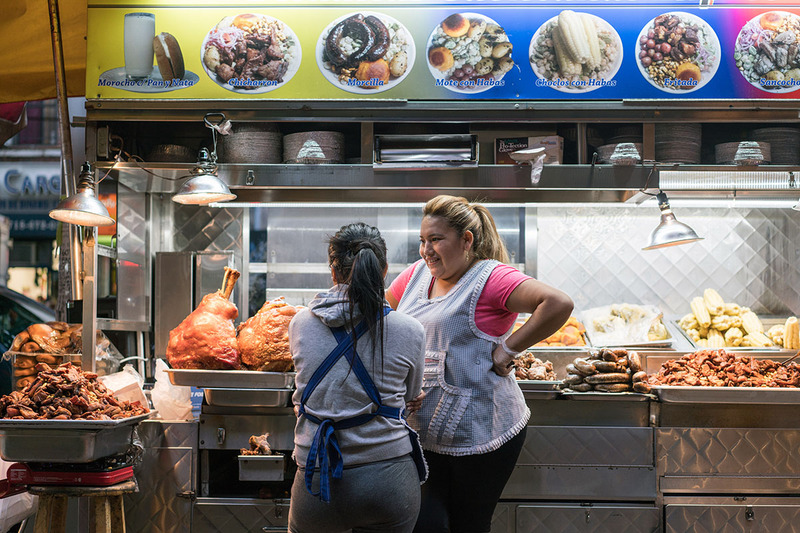 From now on, consider us La Pineda regulars.